It's not uncommon for Midwestern winters to feature the occasional plunge into single digit temperatures. Still, it doesn’t make the cold any easier and the feeling is a far contrast from the humid, muggy days of an Ohio summer. The kind of days you might spend on an amusement park midway, just as the lights are coming on right before night settles in, a relevant experience whether it’s the turn of the century, the “fabulous 50s,” or the modern era of corporately backed carnivals. That sort of mental image was of little comfort, though, as I pulled into a gas station to fill my tires with air, the dashboard thermometer registering at two degrees Fahrenheit. I was annoyed and running late to meet my friend at the gravesite of two amusement parks, a memorial that claimed to serve delicious food. 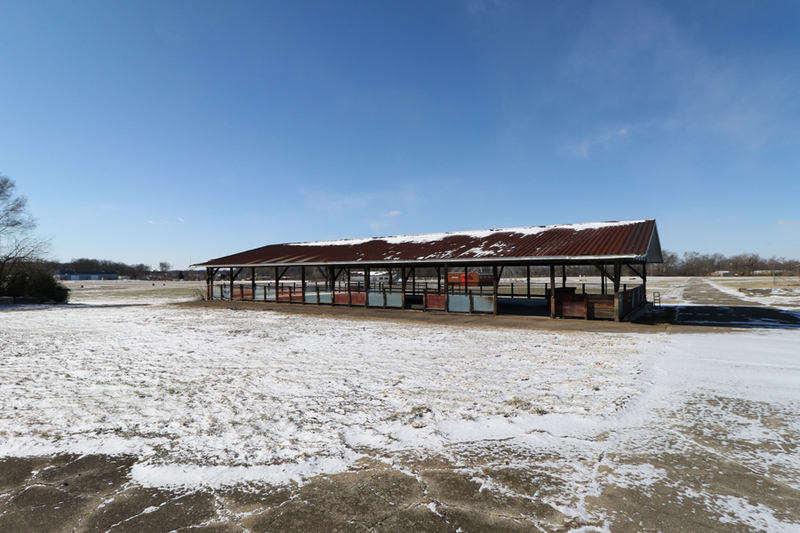 Twenty minutes down the road (and ten minutes late), I pulled up to what was once known as Fantasy Farm Amusement Park, while the few remains of another park—Americana/LeSourdsville Lake—stood in the distance. - Carousel horse outside of the Fantasy Diner and Ice Cream Parlor. 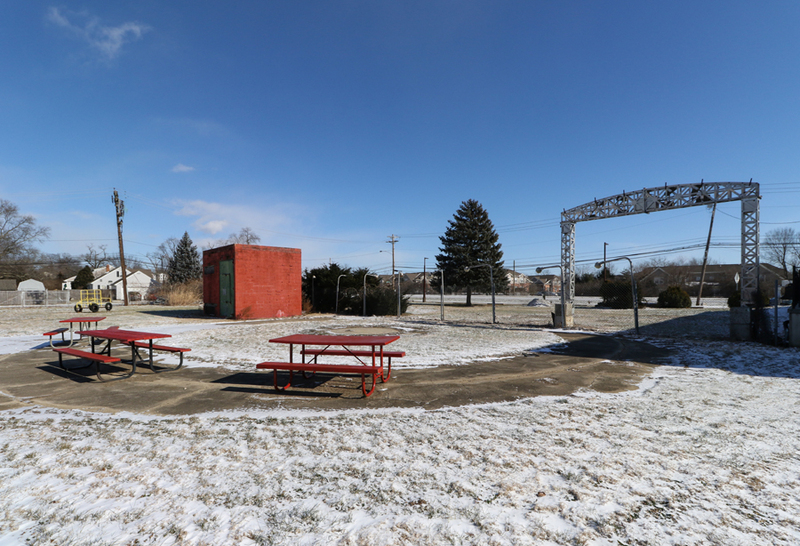 In an area of Ohio that was often billed as Middletown, but is technically Monroe, there were once two amusement parks. LeSourdsville Lake (later Americana) was the first. Born out of a lakeside campground, a classic American park grew up and became a beloved local destination complete with a renown wooden coaster, classic midways, and visits by iconic entertainers of their respective eras. - LeSourdsville Lake/Americana during its heyday. Image via Pinterest. The park had been owned for years by two men. After Don Dazey passed away in 1960, his partner Edgar Streifthau had been forced to sell the park to new investors. Both Dazey and Streifthau had become known for innovations in the industry and Edgar was eager to stay in the game. 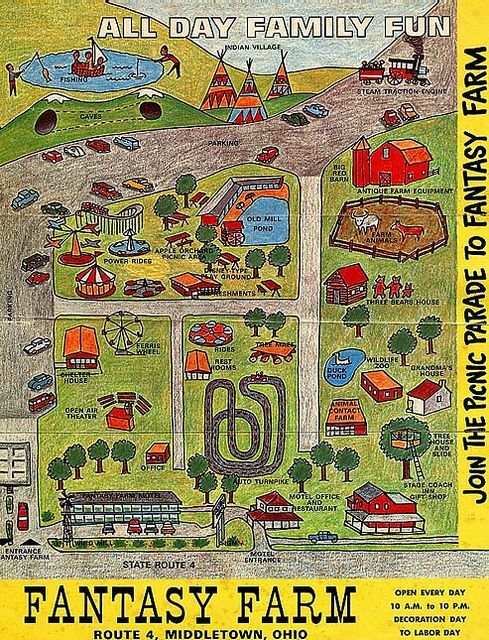 On land he still retained ownership of directly next door, he opened another park in 1961: Fantasy Farm. - Map of Fantasy Farm. LeSourdsville Lake/Americana was right next door. Image via Pinterest. LeSourdsville Lake/Americana carried on as the bigger of the two while Fantasy Farm combined smaller rides and family entertainment with petting zoos and farming exhibits. 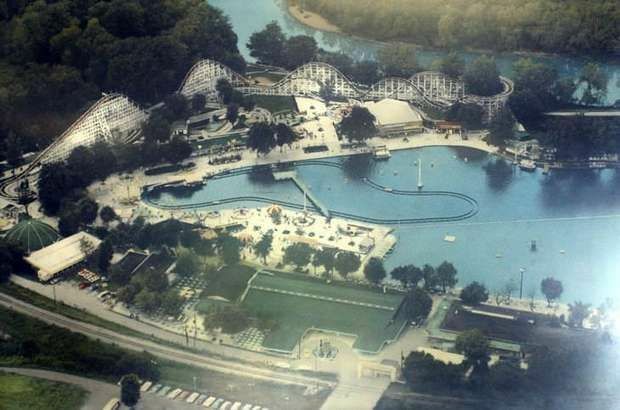 Both would eventually feel the pressure of the massive, relatively close Kings Island in the early 70s and beyond. The new competitor and variety of other factors eventually took their toll. Fantasy Farm fell first, closing its doors in 1991. Americana followed eight years later, locking its gates after the 1999 season and once more after a lone season of attempted revival in 2002. 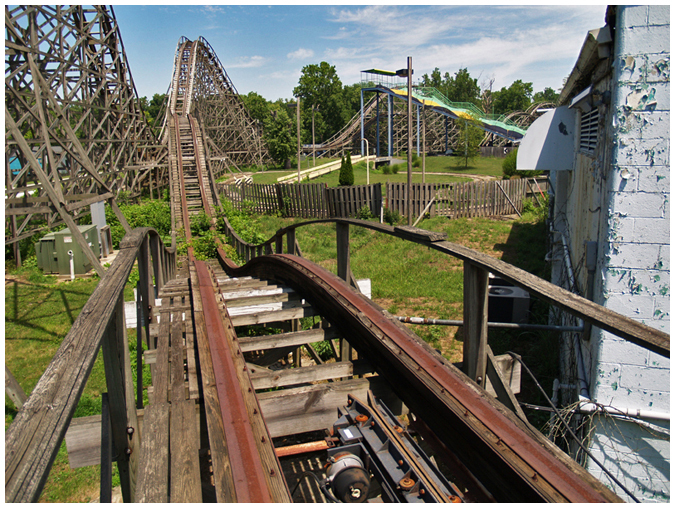 - Americana and its iconic roller coaster, The Screechin' Eagle, seen abandoned in a QC/D story from 2007. The story of these parks has been covered extensively here on QC/D. They were the subject of this website’s very first article back in 2007 when the landowner of the time allowed myself and some friends to tour the shuttered property. Over the years, I photographed the park once more and then did a followup in the Fall of 2018. I only visited Americana a handful of times as a kid and as for Fantasy Farm, well, there's a picture of me at a petting zoo within a family album that I think was that park. - The remains of both parks as seen from a drone in 2018. These days, all of the rides and most of the structures from both parks are gone, the lake totally drained and eliminated. 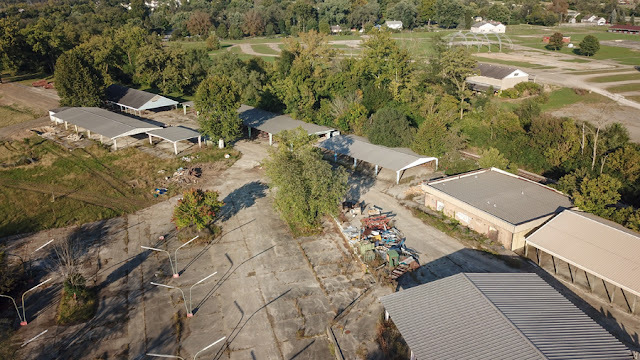 What remains of LeSourdsville Lake/Americana is set to become a city park while the remnants of Fantasy Farm have become something else: the Fantasty Diner and Ice Cream Parlor. 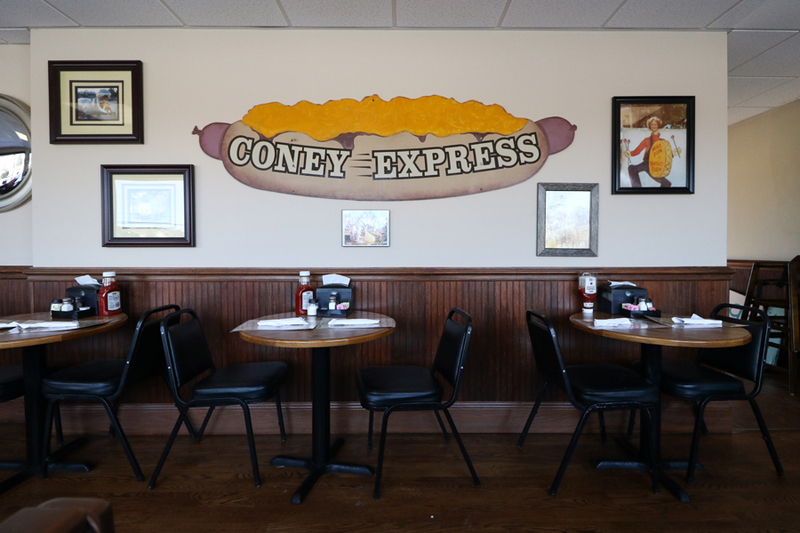 - The Coney Express sign within the diner originally hailed from Americana, then found it was to Cincinnati's Coney Island, before coming to the Fantasy Diner. I had seen the building with its bright red “DINER” lettering back when I was here in September 2018. With mementos of both parks scattered about, an “opening soon” banner was posted. Four months later and I finally made it back for lunch. My friend D.J. is the perfect person to eat with here as I find him at a table in the back, far from the cold outside. His relatives were once owners of LeSourdsville Lake/Americana—his grandmother a performer, his father an employee. He remembers the place well having grown up just down the street, a person who saw both parks in their final days and their subsequent abandoned states. D.J. has a personal insight into the immediate world around us—a flat landscape of windswept structures that are the few remains of two local amusement parks. The history of those properties is honored in this local eatery. 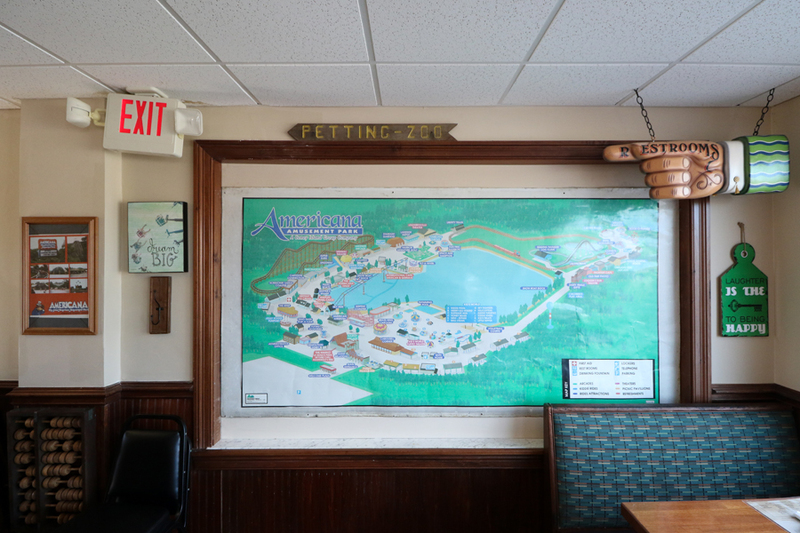 All around us are historical keepsakes: a map of the park taking up a back wall, photographs of the diner’s owner and her family visiting the parks as children, signage from midway games, and so much more. It’s just as much a museum as it is a place to grab a bite to eat. The building we’re sitting in was once Fantasy Farm’s souvenir shop and offices as well as a residence. - Americana map on the diner wall. 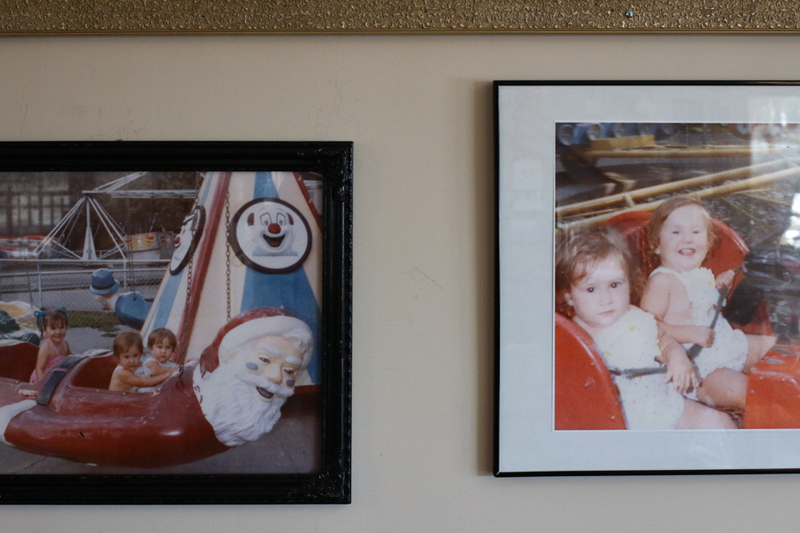 - The diner's owner and her family members captured in photographs while enjoying the former parks. D.J. and I settle in with conversation about the history of the parks, our affection for roadside eateries, and the subject that initially introduced us to each other: lower division, local soccer. Tanner, our server, is knowledgeable about the menu as well as the history. He’s incredibly friendly and speaks with enthusiasm, recommending deep fried dishes and espousing the stories of days now past. D.J. 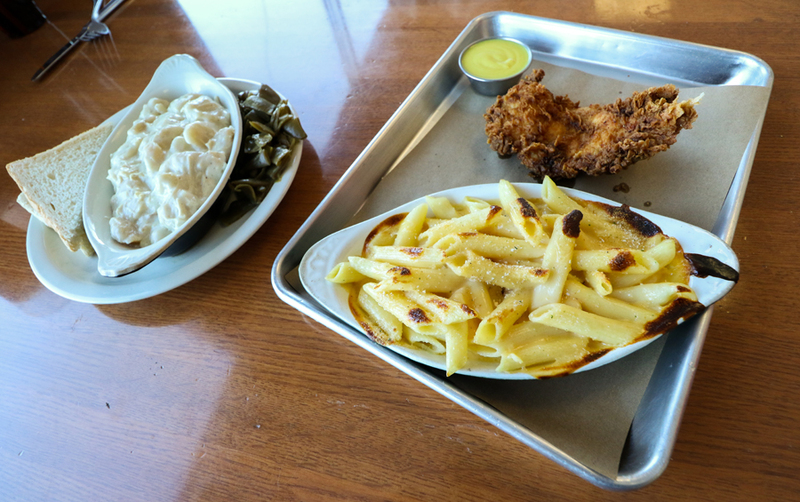 goes for the Wednesday special of chicken and dumplings while I decide on fried chicken served with a boat of mac and cheese. The food arrives and it's fantastic. Despite the frigid cold outside, we can’t resist sampling the business’ other touted feature: the ice cream. 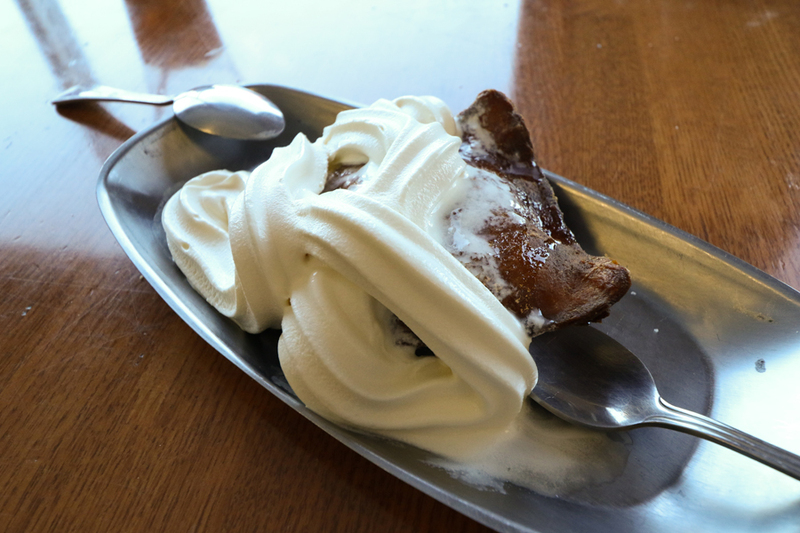 Tanner recommends some deep fried peaches sitting atop vanilla ice cream and covered in whipped cream. It’s reminiscent of a funnel cake, a delicious and appropriate confection to be enjoyed while surrounded by amusement park anthropology. Like our lunches, the dish hits the spot. Sufficiently caught up on life for the time being, we pay our checks and prepare to leave. I hang back for a bit, making photographs and chatting with Tanner about the various relics adorning the walls. A steady stream of customers filters in and out, all of them remarking about their own memories sparked by the decorative memorabilia. 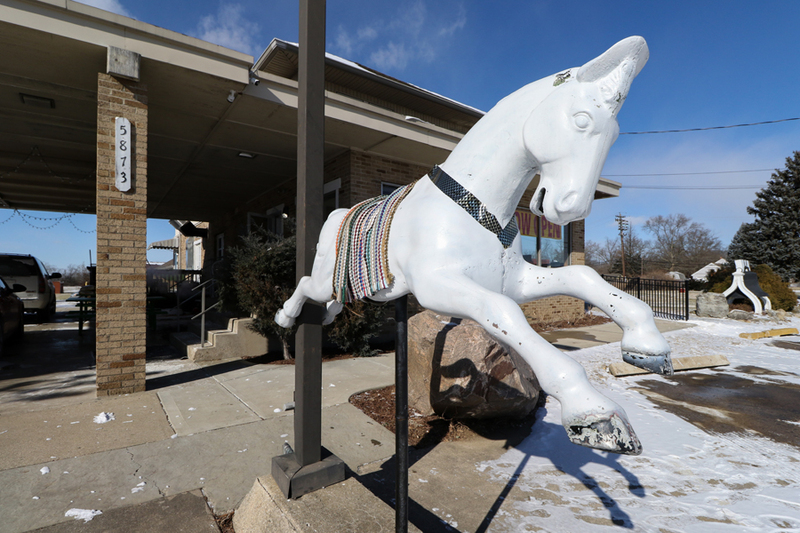 The ground outside is covered in snow, but it’s clear to see that the surrounding property (adorned with restored, original Fantasy Farm playground equipment, a carousel horse, a replica Liberty Bell, and trash bins still showing the Americana logo) will be a favorite local spot for sweet treats in the warmer days. 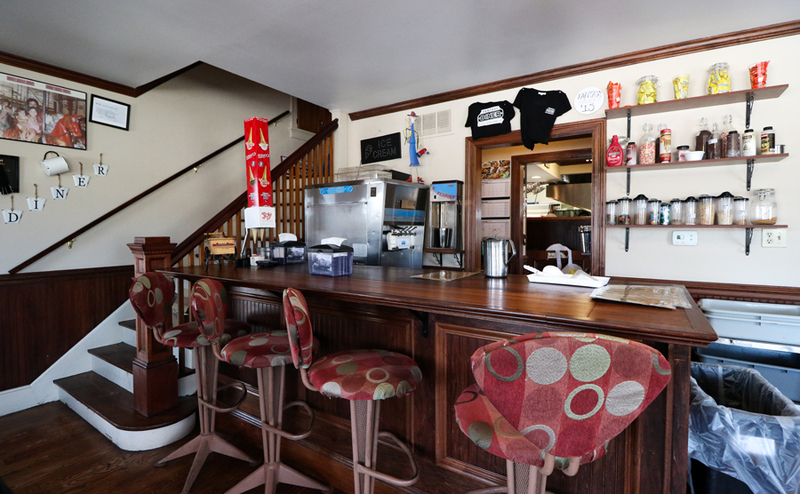 And if you don’t want to wait for the thaw, the establishment’s classic wooden counter provides a traditional ice cream parlor setting inside. - The ice cream parlor's counter. 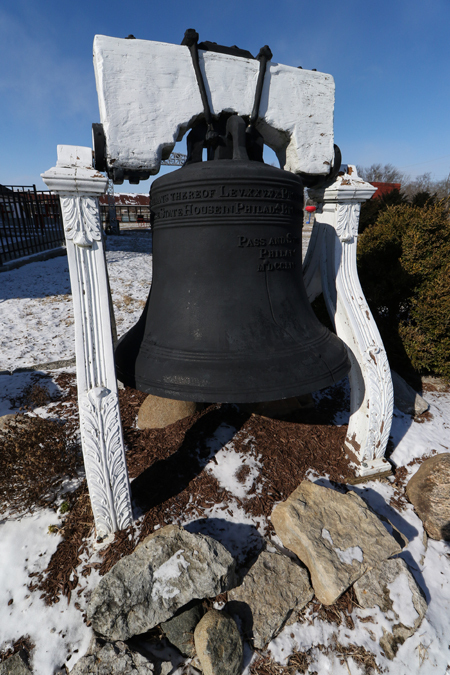 - A replica Liberty Bell that was installed at LeSourdsville Lake/Americana in 1976. - Picnic tables and remnants of Fantasy Farm serve as an outdoor seating area. - A former Fantasy Farm pavilion on the property. 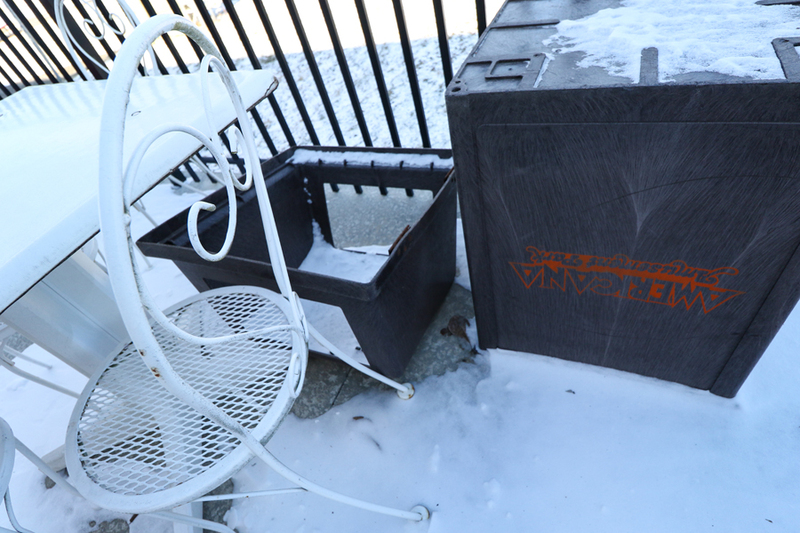 - Trash receptacles from Americana (still bearing the logo) on the diner's patio. 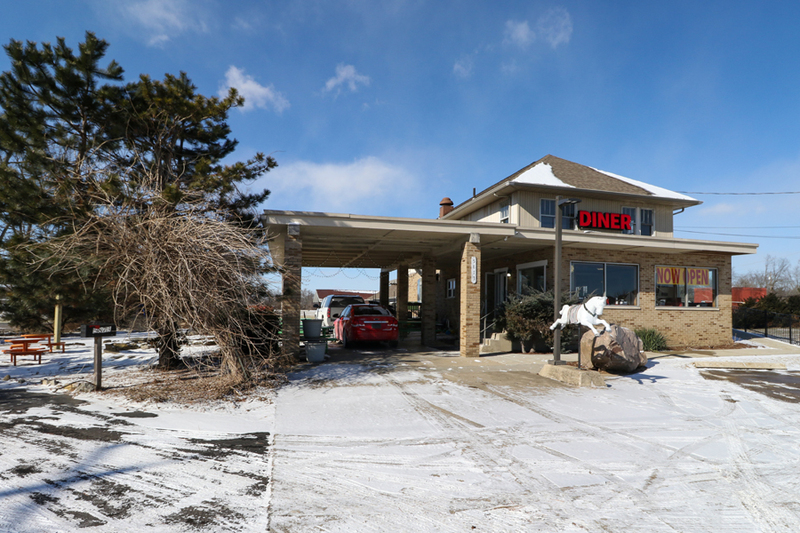 The Fantasy Diner and Ice Cream Parlor doubles as a monument to local history as well as a gastronomically pleasing greasy spoon. It’s a more than solid spot to pop into whether you’re looking for coffee, a hot meal, or fare that calls back to the parks that once stood here—a fitting successor and tribute to the area’s history. You'll find the place alongside Route 4 (at 5873 Hamilton Middletown Rd. to be exact). You can catch breakfast, lunch, dinner, and ice cream between 7am and 9pm every day except Monday. Thank you, D.J., for the good conversation and company on a bitterly cold day and thank you, Tanner, for the excellent hospitality and service. The other stories on LeSourdsville Lake/Americana can be read here and there's a short film I put together a few years back, here. Also: over the years, several QC/D stories have focused on abandoned amusement parks I've visited across the Midwest and near Cincinnati, check those out here. 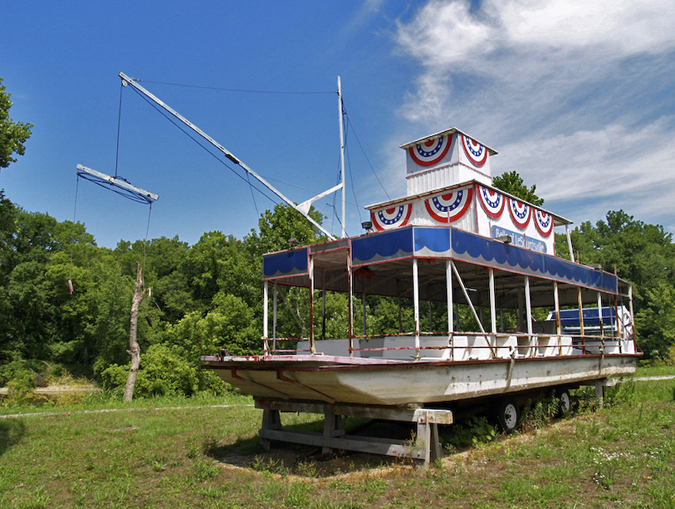 - The "Belle of LeSourdsville," abandoned on a trailer after the lake was drained in 2007. I've driven by this place numerous times and I've wondered if it's any good. I'll definitely have to check it out based on your recommendation considering I live about 10 minutes from there. Let me know what you think. It's a solid diner. Even without the cool historical connection...good eats. The outdoor pavilion is actually the former remains of the ride commonly known as "whip it". Ah, that's what I thought, but wasn't sure. Thanks for clarifying this! This is awesome!!! Thanks for letting me know this place exists. I will make sure to visit. So cool. Be sure to let me know what you think! No street tacos, but great mac and cheese.